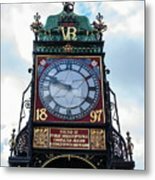 There are no comments for Eastgate Clock In Chester. Click here to post the first comment. 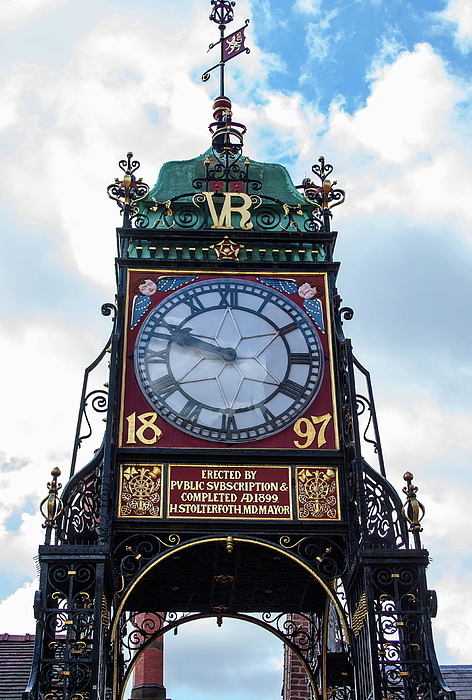 Eastgate Clock in Chester, stands on the site of the original entrance to the Roman fortress of Deva Victrix. The original gate was guarded by a timber tower which was replaced by a stone tower in the 2nd century, and this in turn was replaced probably in the 14th century. The present gateway dates from 1768 and is a three-arched sandstone structure which carries the walkway forming part of Chester city walls. In 1899 a clock was added to the top of the gateway to celebrate the diamond jubilee of Queen Victoria two years earlier. The clock was designed by the Chester architect John Douglas. 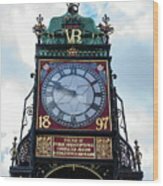 The whole structure, gateway and clock, was designated as a Grade I listed building on 28 July 1955.